The name means different things to different people. At my favorite venues in Singapore and in New York, the laksa has a coconut base, and at the Malaysian Mission in New York, I've sampled laksam from Kelantan and an egg-bolstered bowl from Johor. 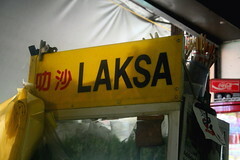 To be sure, there are as many versions of laksa as of barbecue. In Penang, the prevailing flavors are tamarind (assam jawa or sometimes asam jawa in the Malay language, commonly shortened to assam) and fish (here, perhaps mackerel). 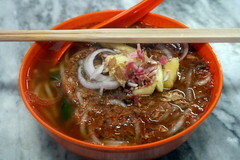 Filled with thick rice noodles, my bowl of assam laksa (rm 3) had a splendid tang from the sour tamarind; the onion and pineapple retained most of their original character.